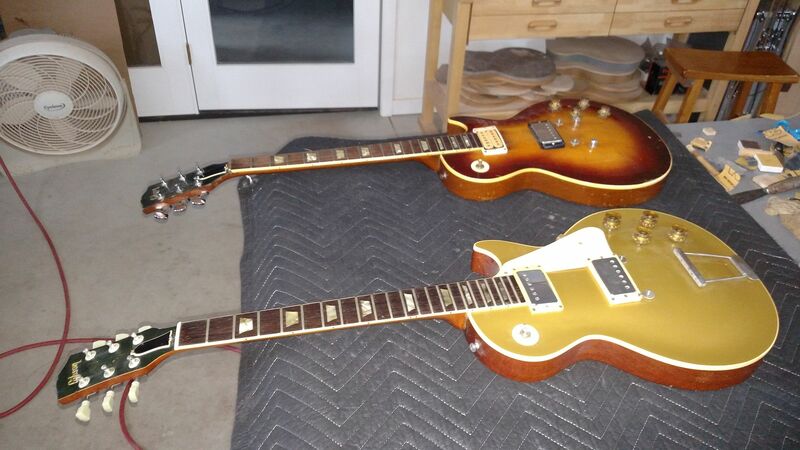 A customer of mine sent me two 1950’s P-90 LP’s for conversions. He didn’t know the production year of either guitar and asked for my input. 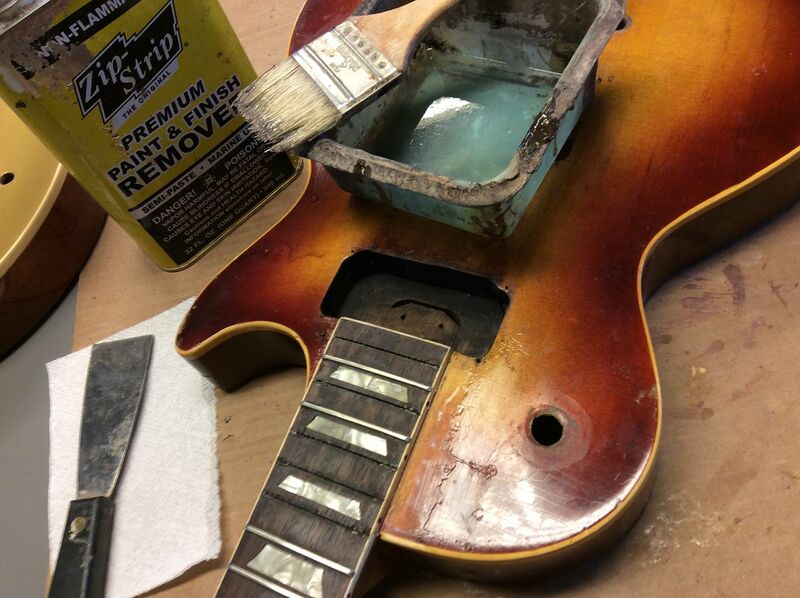 Both guitars have issues but with some TLC will make great player old wood guitars. I’d date this one as a late 55, 56 or 57. It has a factory stop tail and ABR1 bridge. Nasty gouge on neck and a SS# etched into the heel. 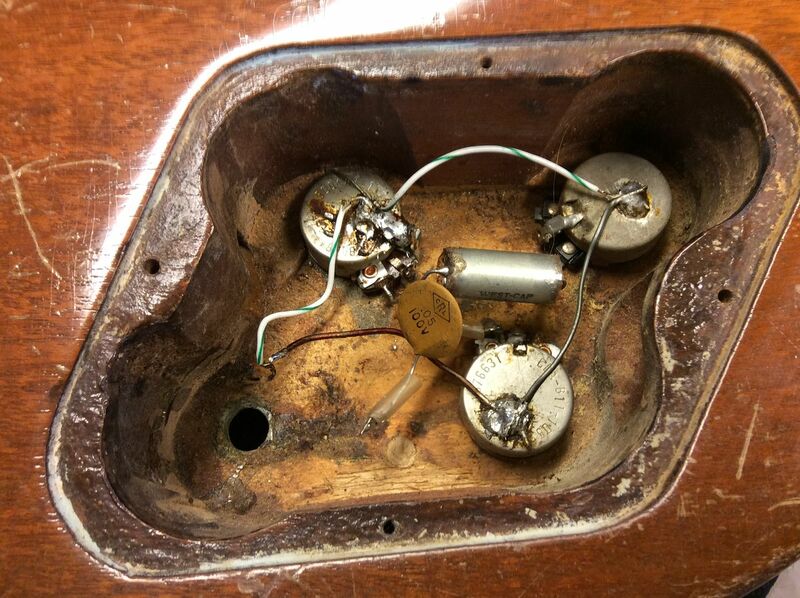 Both P-90 routes were poorly enlarged for a humbucker. 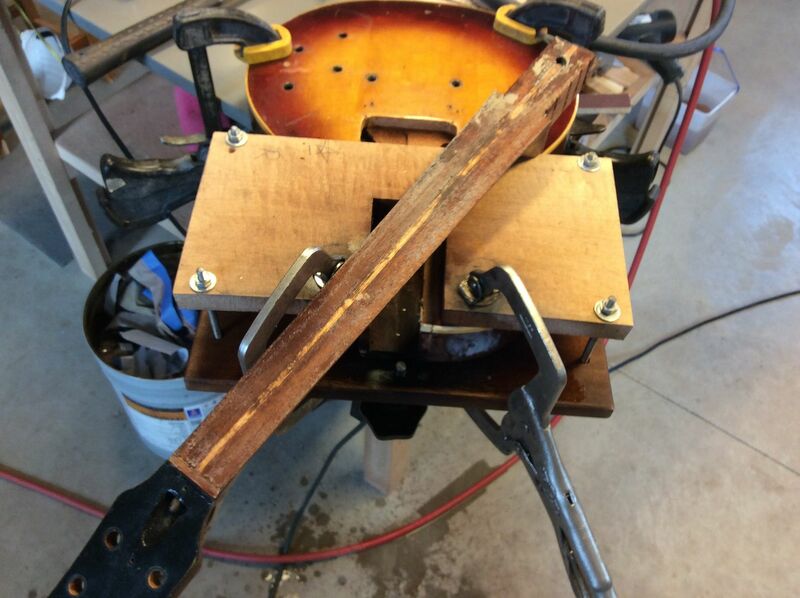 The original fingerboard was removed at some time. 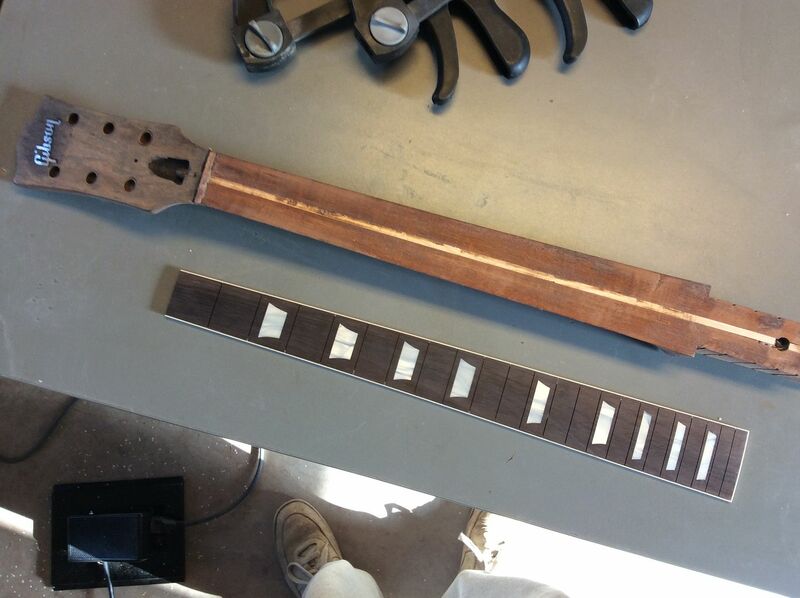 The fretboard on the guitar is narrower than the neck wood. 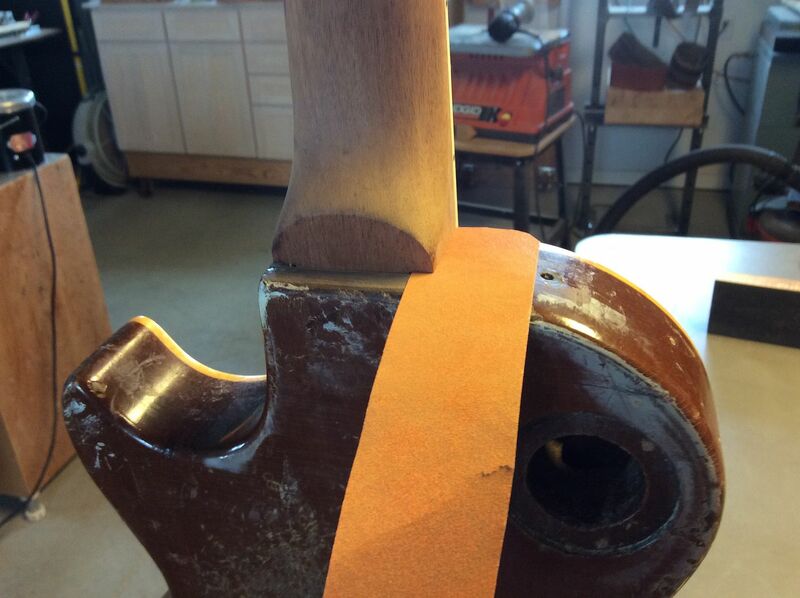 You can see the mahogany sticks out past the binding on both sides. 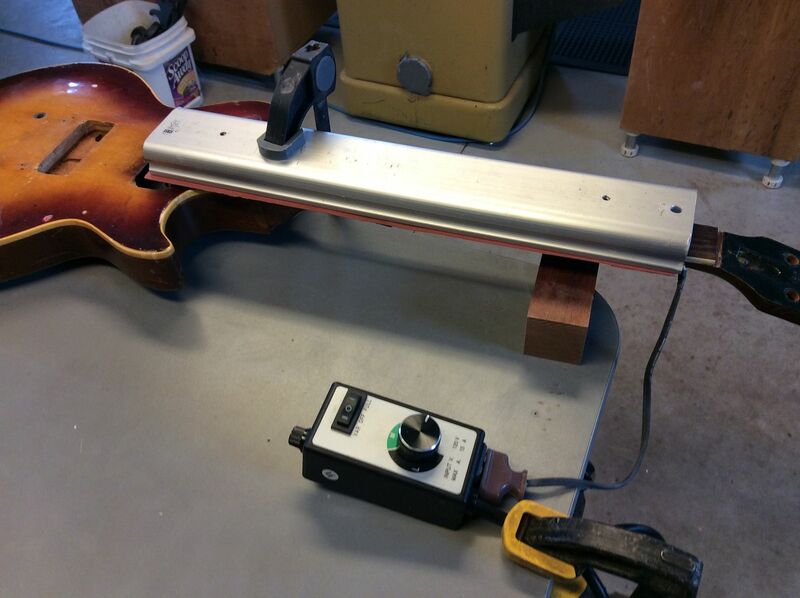 First thing is to remove the existing fingerboard. 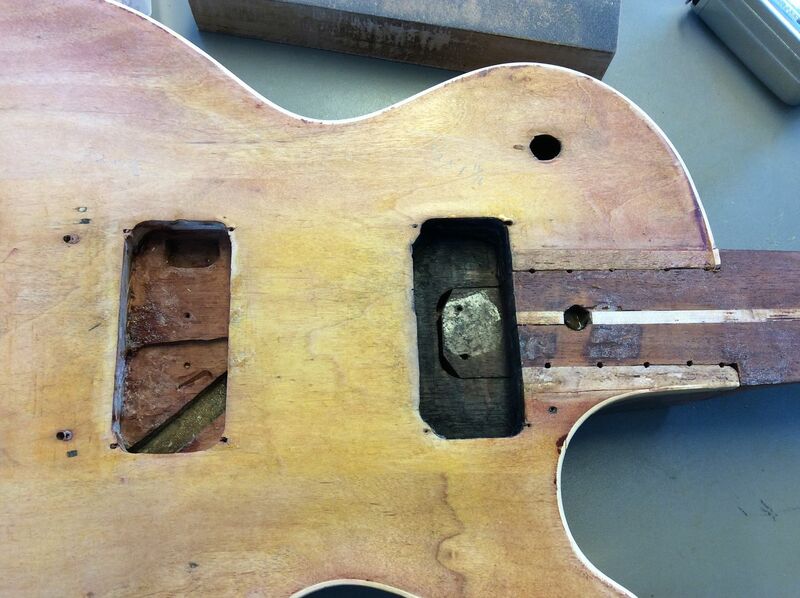 Fingerboard removed, you can see the neck has never been out of the guitar. 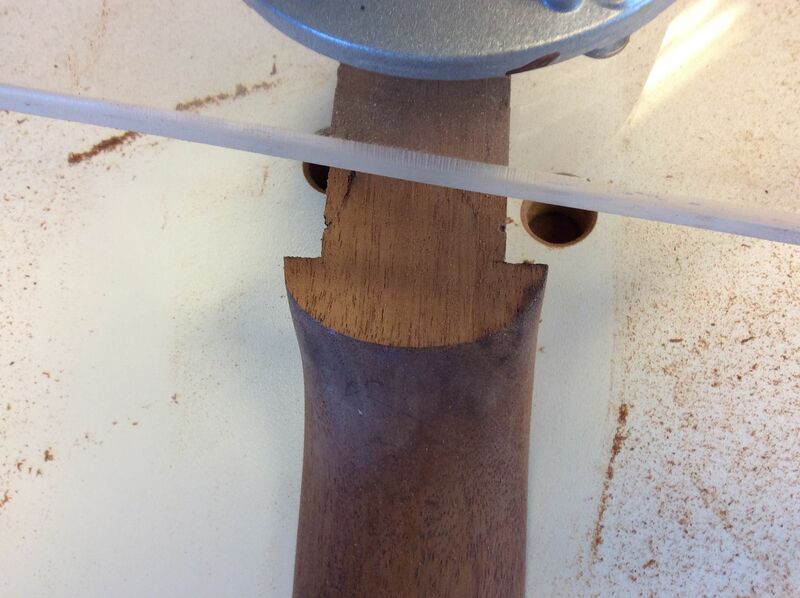 I'm going to pull the neck, glue in a thin piece of mahogany so I can sand out the SS# etched on the heel. Steaming out as much of the etched SS# as I can. 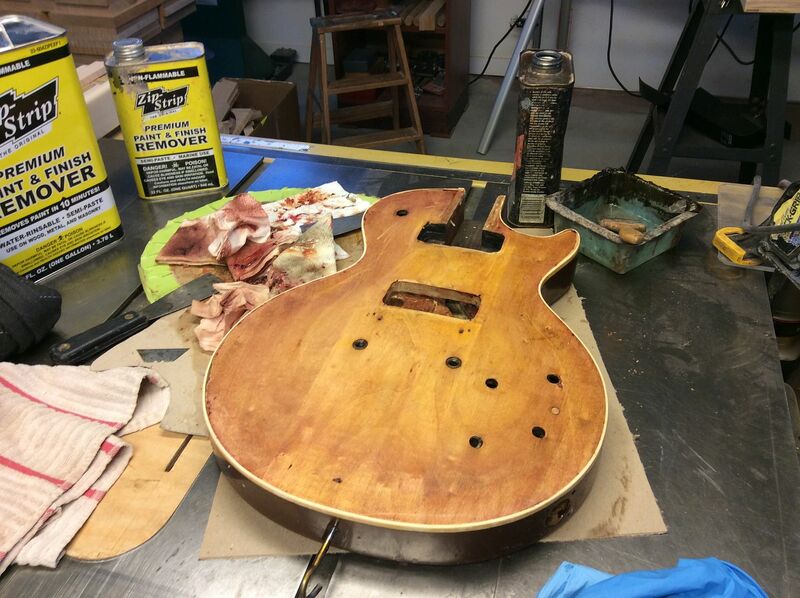 A little sanding and the SS# is gone. 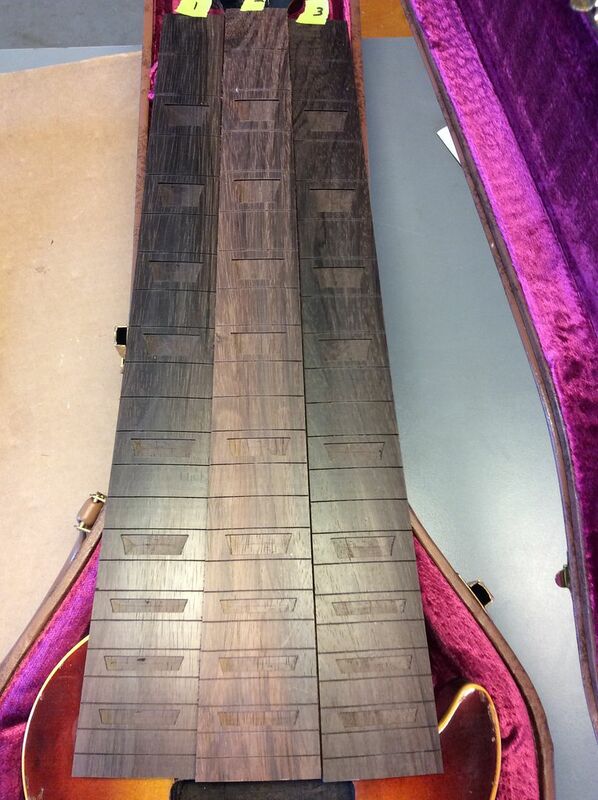 A dark Brazilian fingerboard with nitrate inlays and Bartlett binding ready to go. 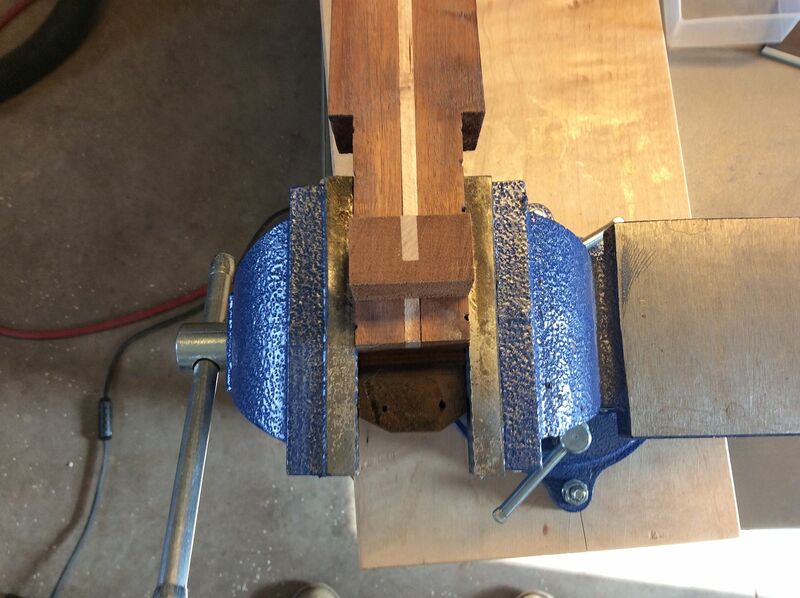 Gluing a small chunk of mahogany with a maple spline to the end of the tenon. You will see why I did this when I route out for the pickups. 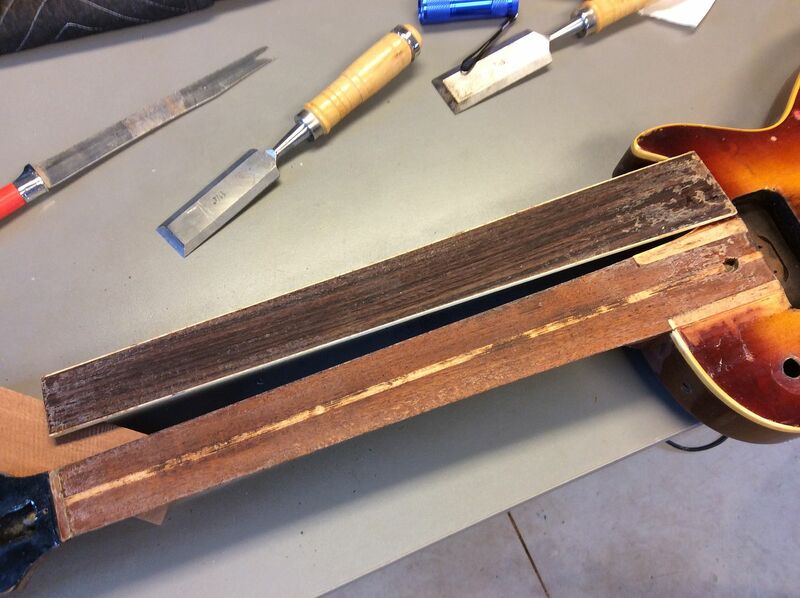 Gluing the Brazilian fingerboard using hot hide glue. 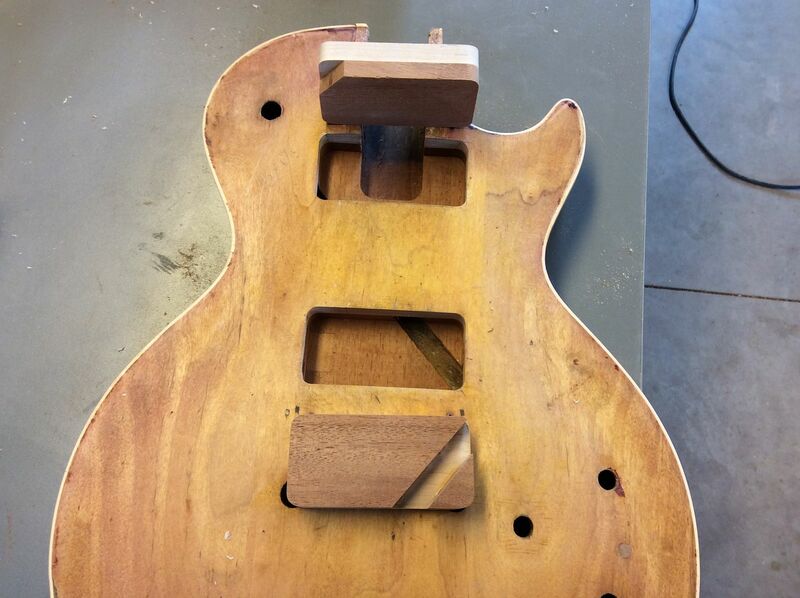 The neck is ready to be glued back into the body. 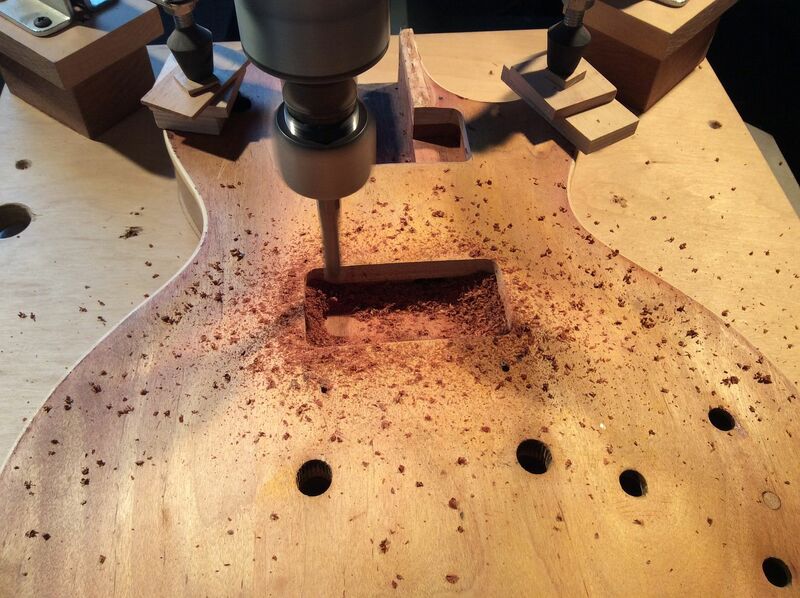 What are you going to do with the gouge? Bondo? 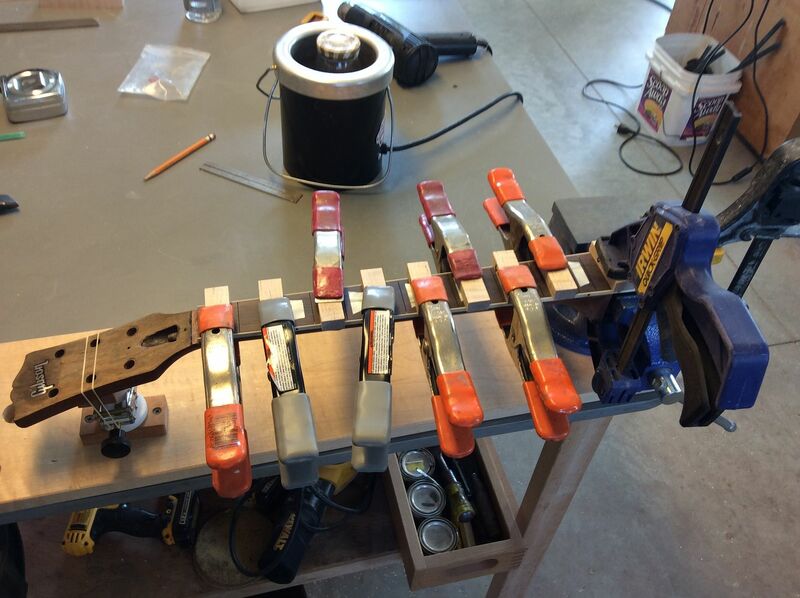 Awesome project, Jim! And great to see you back at it again. I hope you're doing well. 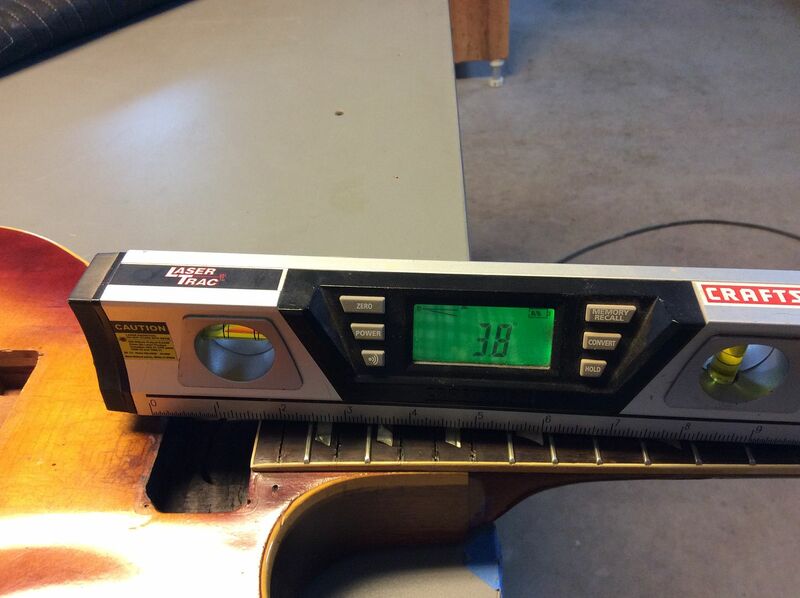 Question...what did you decide to do about the discrepancy between the width of the fingerboard and neck. 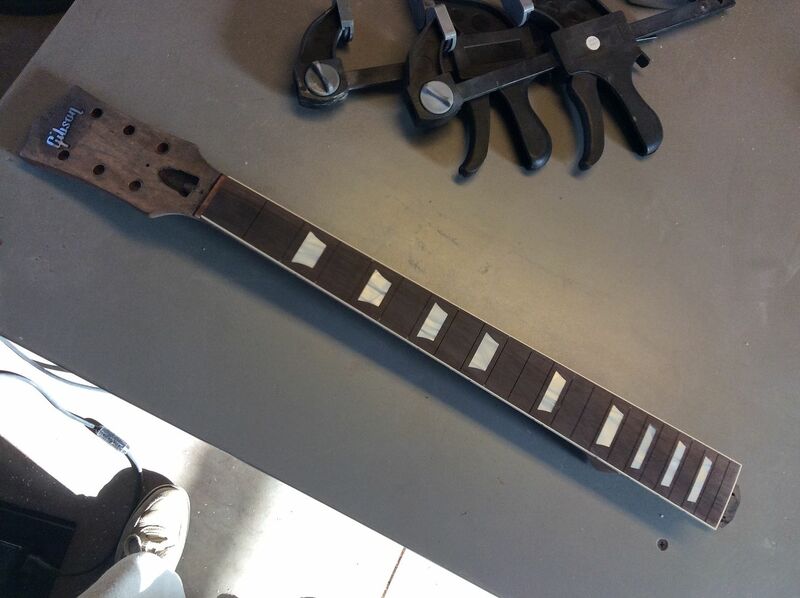 Did you use a little wider binding, add a little wood to the side(s) of the fingerboard, or make the neck a little narrower? 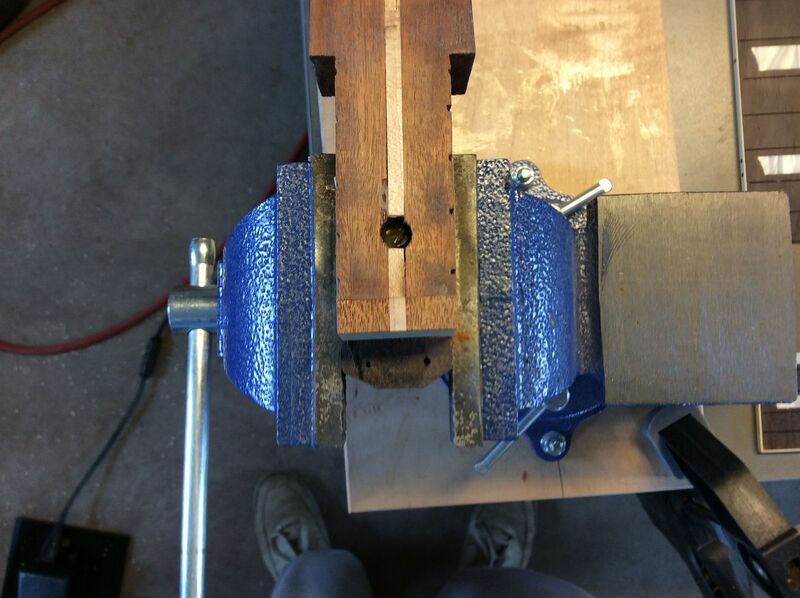 The front of the headstock actually looked pretty good. 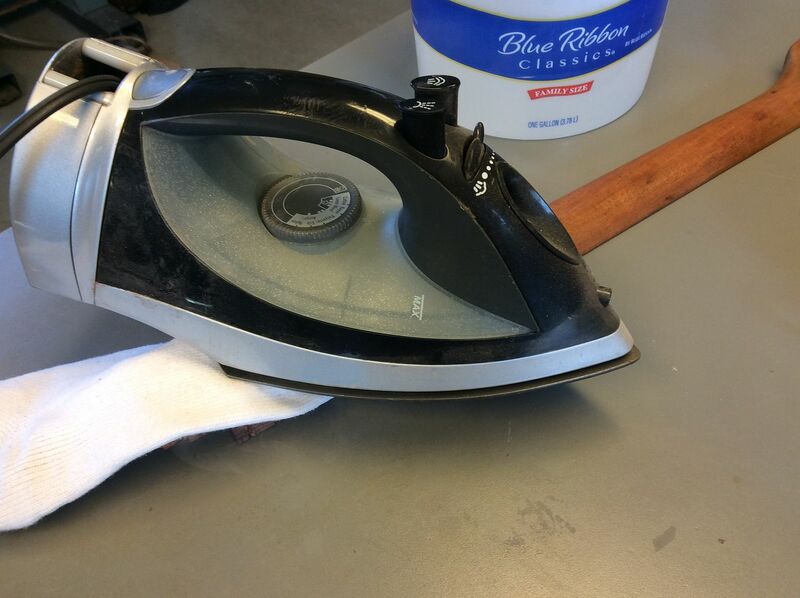 Not sure why that needed to be stripped? 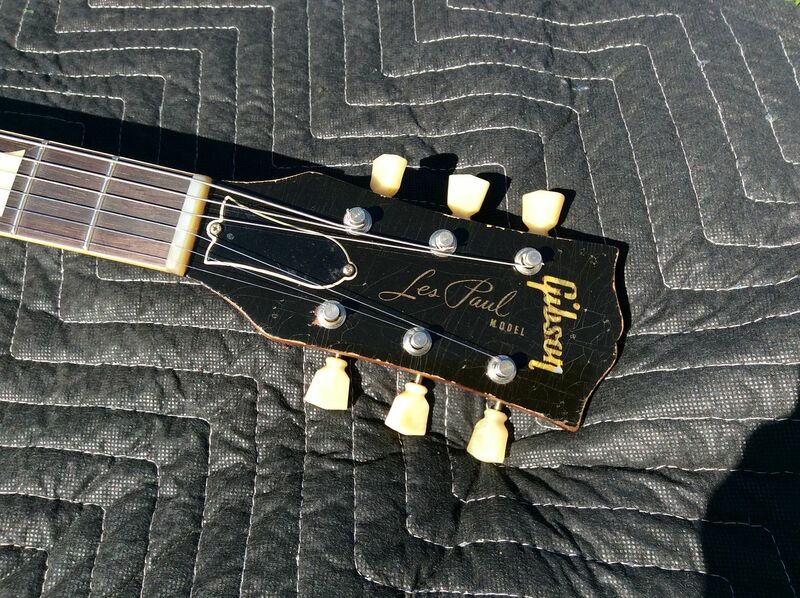 Also looks like all of that work could have been done with the neck still in the guitar. Jim has done one or two of these in his day so he probably has some good reasons. 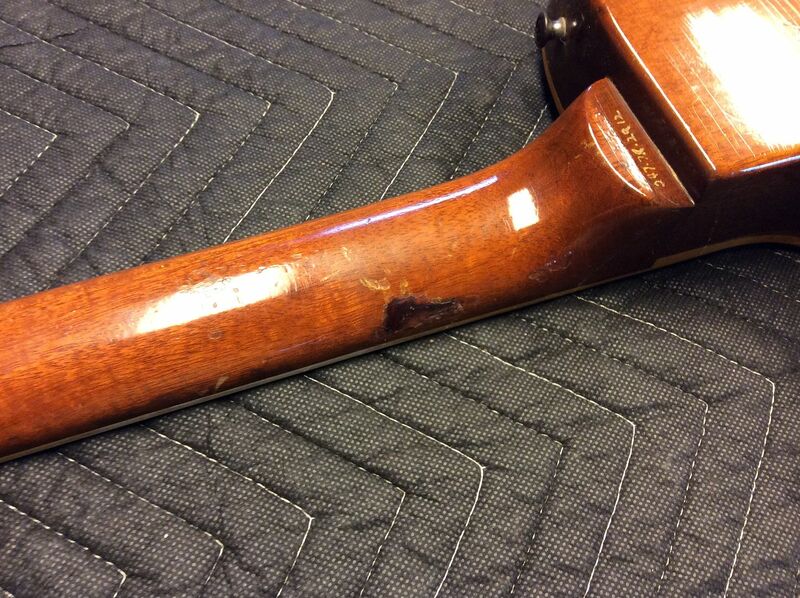 The neck was removed to fix the serial number that was etched on the heel of the guitar. With the one I'm doing for myself it makes 69 conversions I have completed. I've taken a lot of heat over the years but like I've said.... To Each his Own...!! 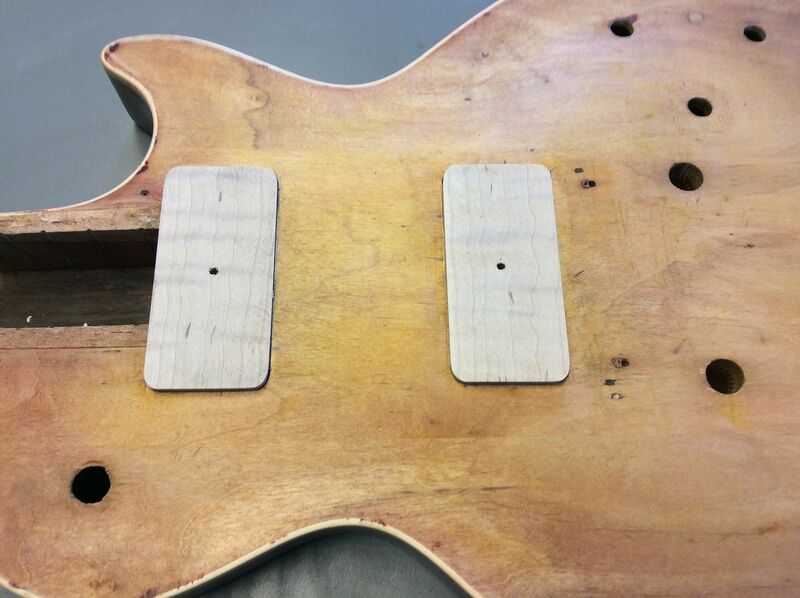 Next up the body.... It's going to need some work especially from the hack job on the pickup routes. Someone also plugged and repositioned the ABR1. 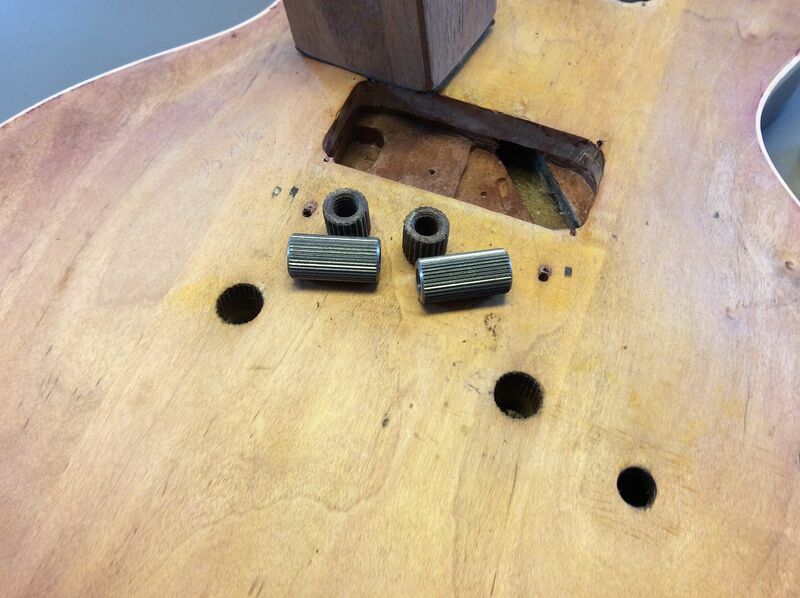 Someone had taken the original bushings out and installed the short ones. I'll install a set of Retrospec 1" bushings. 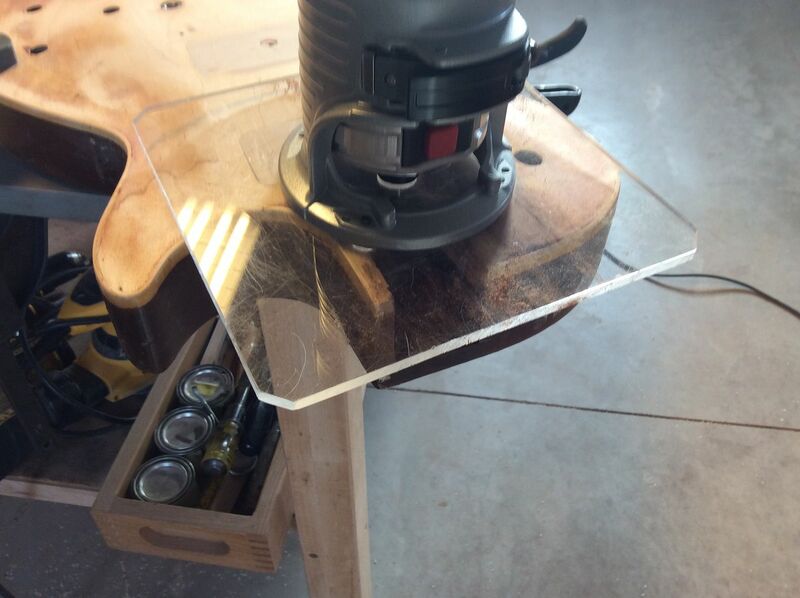 I made a template so I could use my OH router to clean up the pickup routes. 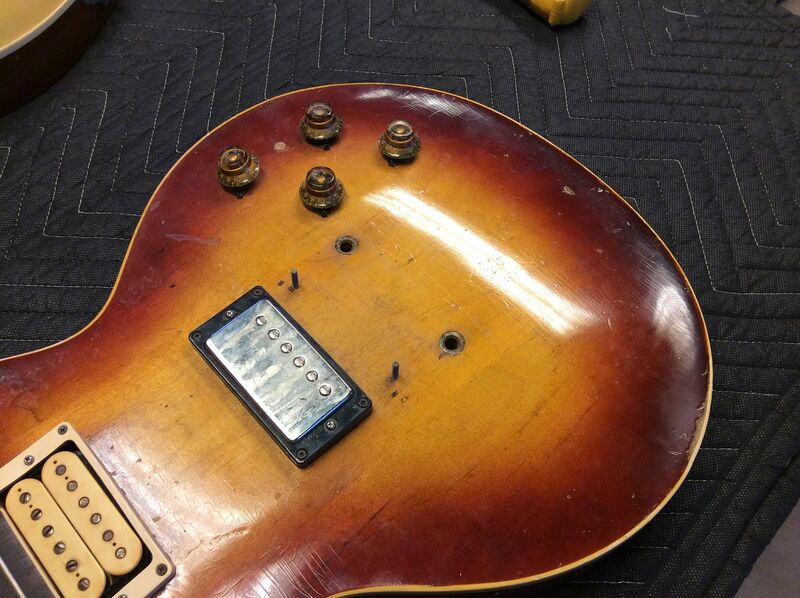 Both pickup cavities cleaned up. 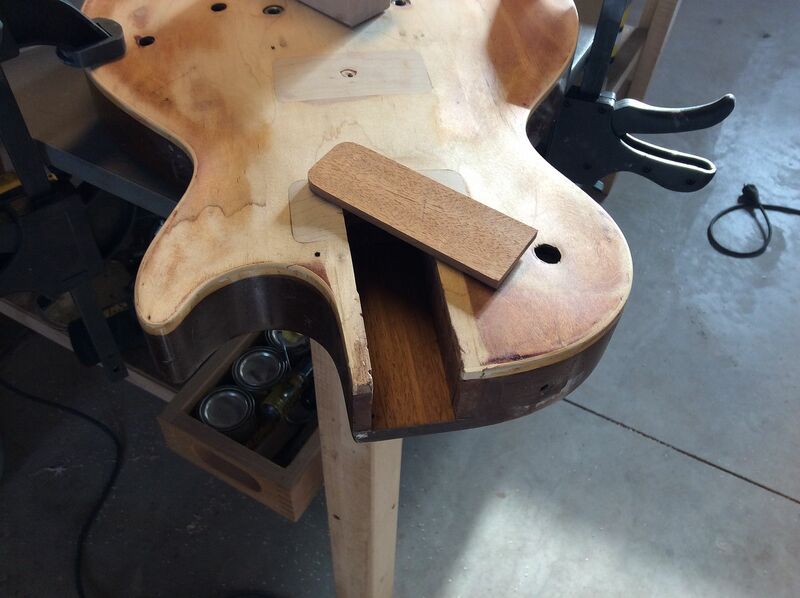 Maple/mahogany plugs made for each cavity. 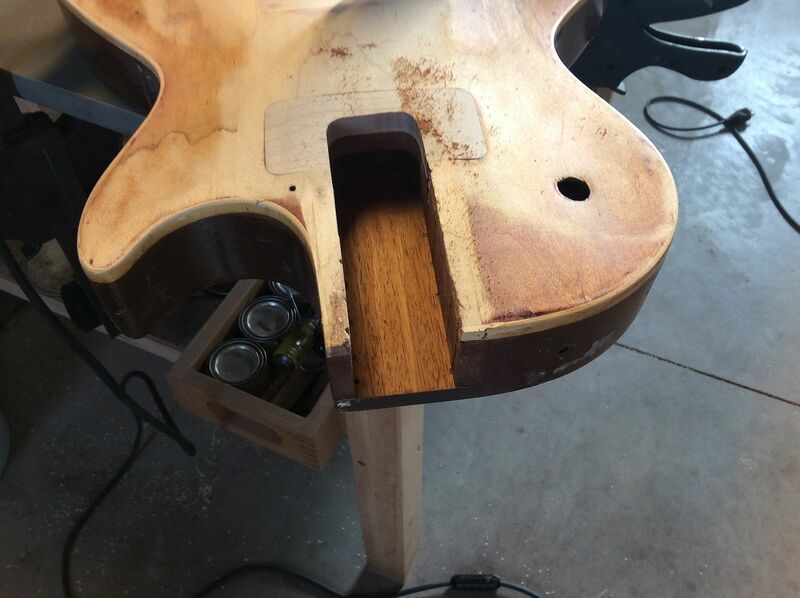 Both plugs glued in using hot hide glue. 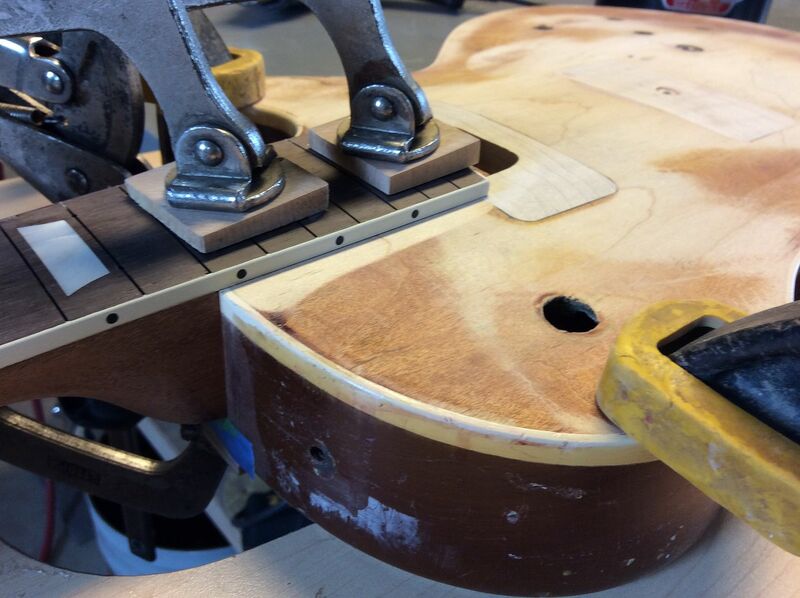 Hand fit the neck for a perfect fit. 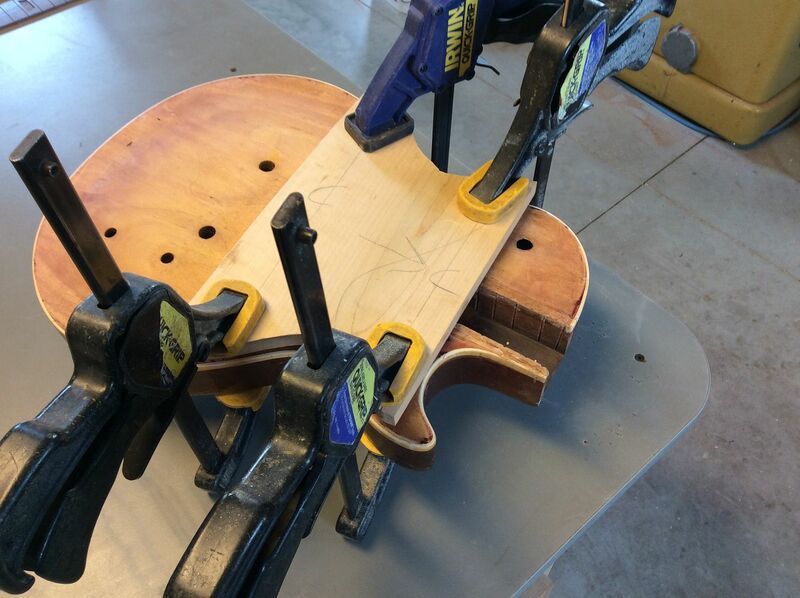 I'll do a dry fit. 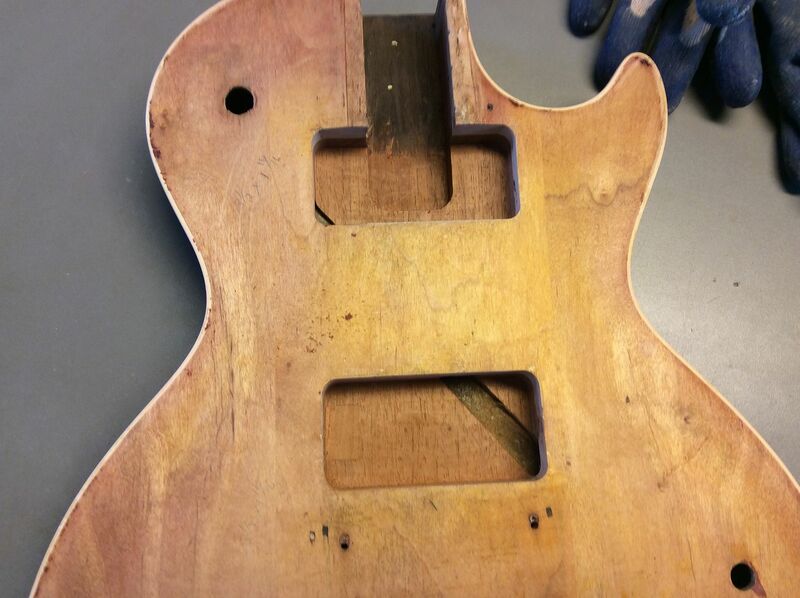 The neck sets perfect off the body. 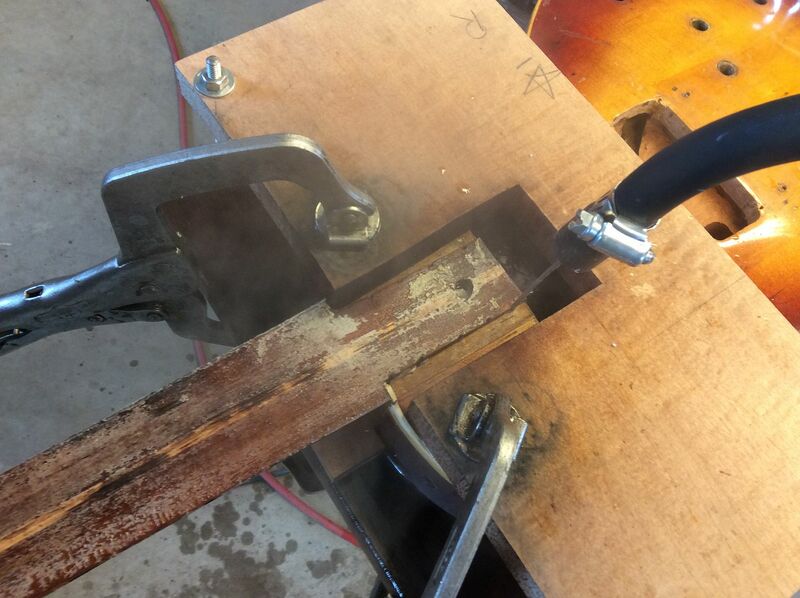 I removed the resin filler, mixed up some mahogany saw dust with super glue and filled the gouge. 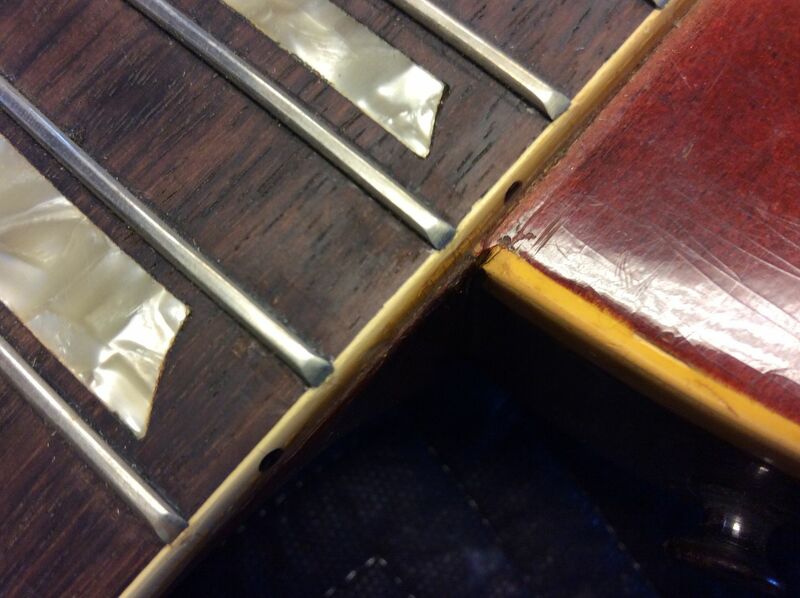 I'm not trying to hide the repair but fix it so you don't feel it when played. Do you normally take the engine out of your car to change the oil? Thanks for taking the time to post these photos, Jim. Its always a pleasure to see your work!